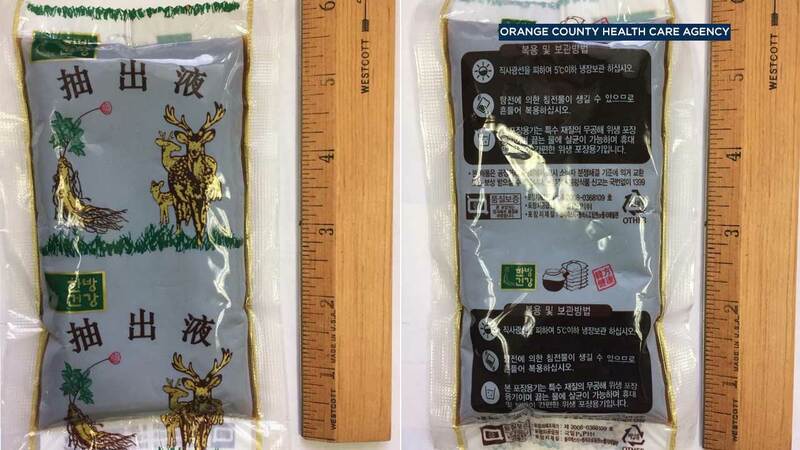 ORANGE COUNTY (KABC) -- There's been one confirmed case of botulism in Orange County, and it is linked to the consumption of tea made with deer antlers, health officials said. In addition to the one confirmed case, there has also been one suspected case. Both cases involve adult residents in Orange County, according to health officials in Orange and Los Angeles counties. The deer-antler tea linked with the botulism cases were acquired during the month of March. Health officials recommend anyone who bought or was given this tea - or a similar product - immediately dispose of it. Botulism is a rare but serious illness caused by a nerve toxin that is produced by the bacterium clostridium. Classic symptoms of botulism include double vision, blurred vision, drooping eyelids, slurred speech, difficulty swallowing and weakness. These are all symptoms of muscle paralysis caused by the bacterial toxin. If untreated, these symptoms may progress to cause paralysis of the respiratory muscles, arms, legs, and trunk. In foodborne botulism, symptoms generally begin 18 to 36 hours after eating a contaminated food, but they can occur as early as 6 hours or as late as 10 days. The respiratory failure and paralysis that occur with severe botulism may require a patient to be on a breathing machine (ventilator) for weeks or months, plus intensive medical and nursing care. The paralysis slowly improves. For more information on botulism, visit https://www.cdc.gov/botulism/.